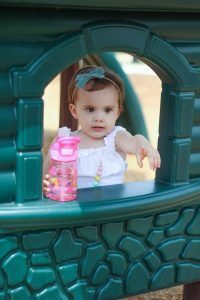 The products mentioned were sent from Nuby for an honest review. As always all thoughts an opinions are 100% my own. This post contains some affiliate links. This means with a purchase I can make a small commission, which helps keep this blog running. Now that the weather has warmed up we have been hitting up our neighborhood and local playgrounds. Izzy loves snacking… I think it’s how she keeps her energy level up. I mean she is non stop! 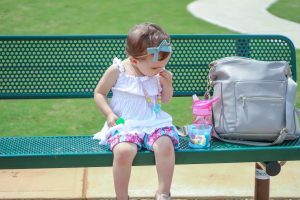 Our favorite playground snacking products are from Nuby. 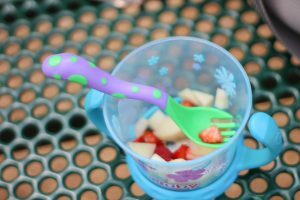 Take the cover off of this snack keeper and it’s perfect to fill with chopped up fruit for your toddler to munch on at the park, playground or when at a picnic. Keep the cover on when your toddler isn’t practicing using their silverware. We use this snack keeper daily with dry snacks when on the go and at home. I keep a fork and spoon set in my diaper bag for Izzy. 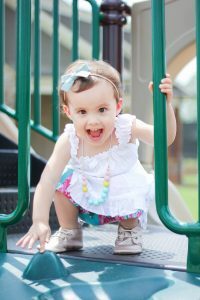 The shape is perfect for little hands & Izzy loves the bright colors and designs. 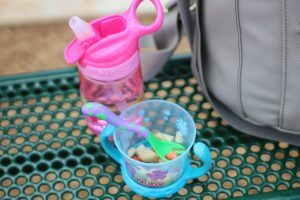 Mom win: they are BPA free! 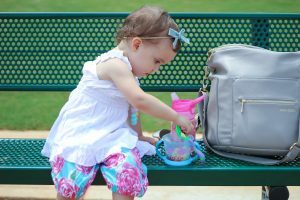 Thi BPA free water canteen easily fits in the front pouch of my diaper bag. It also sits perfectly in Izzy’s carseat cupholder so it’s really made to be on the go. The cover is no spill when closed. Izzy loves pushing the button to pop open her water. I love that the spout stays clean because she closes it after drinking. This cup is being released mid May to Babies R Us stores, so set your reminders! Stay hydrated and full this summer friends! Yay for park days!! It’s actually starting to get too hot here for the park ?? the snack keeper is so good ?? Oh man, ya Florida weather. Great items. My girl needs that cup! We love all things Nuby! 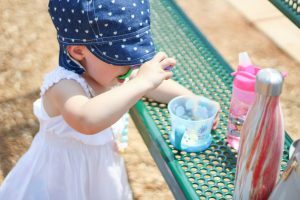 We LOVE Nuby, they have the best products for kids!